Many ConAgra brands are household staples—moms know and trust brands like Orville Redenbacher’s, Snack Pack and Chef Boyardee. And ConAgra is really good at speaking “mom”. When the masterbrand wanted to become fluent in “Millennial”, we helped find a way to capture this alien life form’s attention over and over and over again. 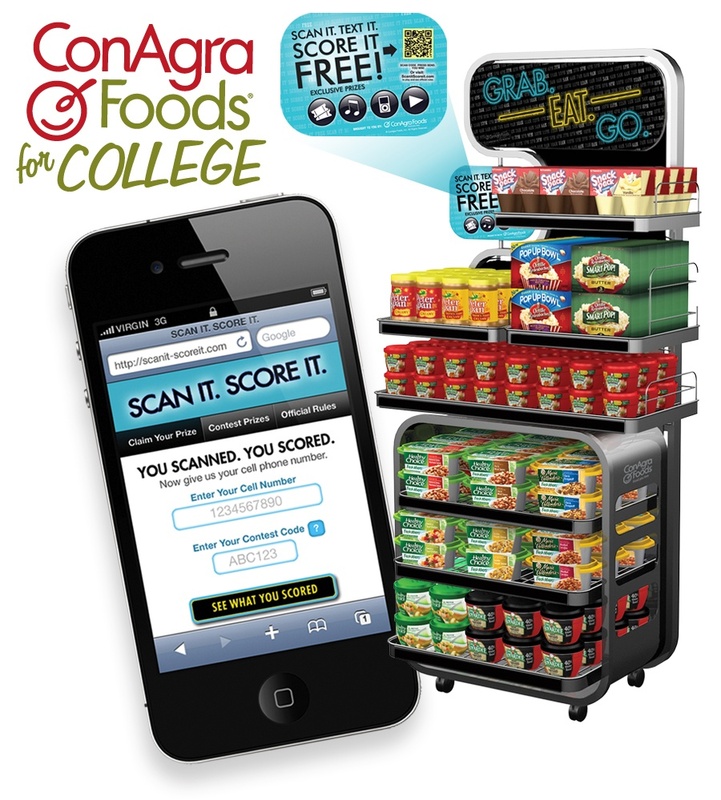 Quick, convenient, inexpensive, filling, and tasty—ConAgra delivers what college kids crave. Yet, in busy store environments, these same kids were completely bypassing ConAgra’s multi-brand solution centers. When a Millennial walks right past Snack Pack and Chef Boyardee, we consider it a major #fail. For a generation that has everything—and can get anything—at their fingertips, Millennials spot trends and wield an influence that makes or breaks pop culture. 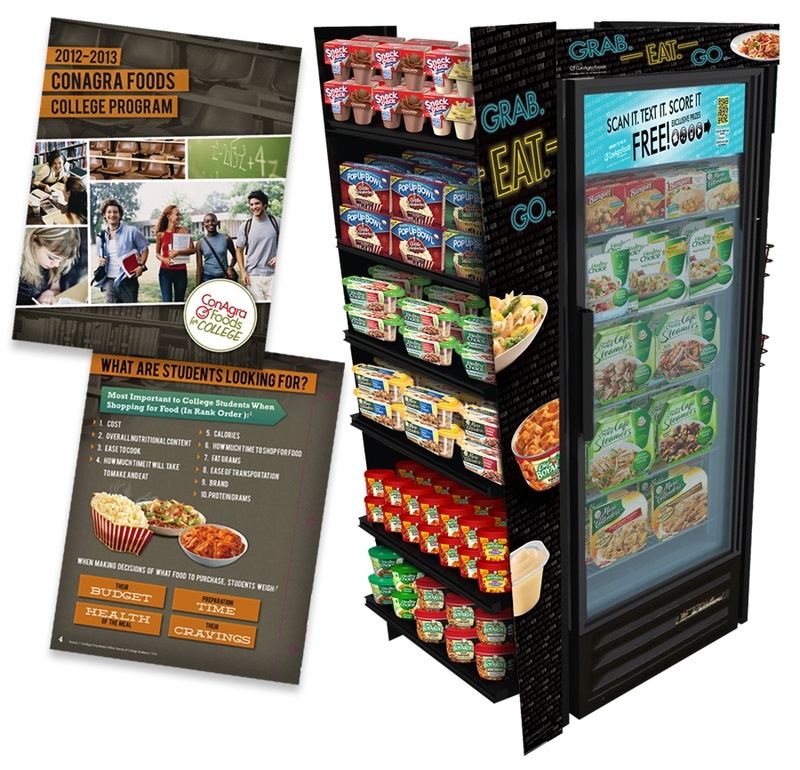 To capitalize on this insight we reinvented ConAgra’s multi-brand displays, creating a destination within the convenience store. This multi-solution center enabled Millennials to grab goodies on the go—and feed a desire for discovery. We brought unsigned and independent bands together with ConAgra, forming a digital library of "first listen" artists that Millennials could download directly from displays. Then we turned our free music giveaway into an all-out contest of randomized freebies. Each day, they could scan the code and score a completely random prize. It could be an mp3 track or a music video from our artist collection. Or better yet, the prize might be a free tablet computer or pre-loaded Visa Gift Card. But, it was impossible to know in advance, driving return visits.